31–year–old Fumiko Hayashida, a pregnant mother of two was one of 227 members of her community who, dressed in their best clothes, assembled at the Eagledale ferry landing on March 30th, 1942. 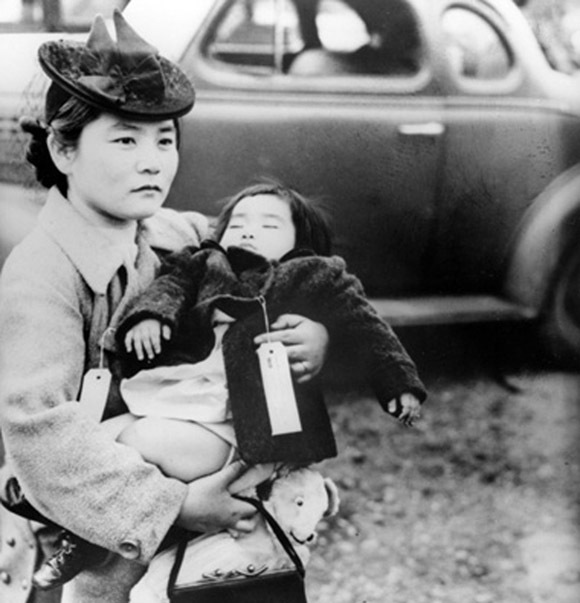 As they waited to be taken off the Island by armed military escorts, Fumiko, holding her 13–month–old daughter Natalie Kayo, was photographed by a Seattle Post–Intelligencer photographer. The photograph has since become a lasting iconic symbol of the internment experience. Congrats on being selected as one of 5 finalists for the Tamarac Fire Station 78, i am a public artist as well as a public art consultant living in Coral Springs, FL and had also applied. Just got onto your website and looked at your artwork. Really fantastic!! Read your blogs…and I am still laughing at how to deliver 1000 lbs of clay!! You are delightful! Hope our paths cross one day.